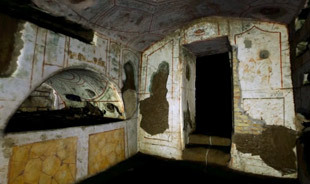 Select the image to watch video from the Domitilla Catacombs in Rome. The idea that certain places in this world are holy is central to the cult of saints, either because they house the relics of holy men and women or because they contain traces of their long absent bodies. It was the desire to gain proximity to such holy places that inspired the first pilgrims to make their way to Jerusalem, where they walked in the footsteps of Christ and visited the scenes of his martyrdom. 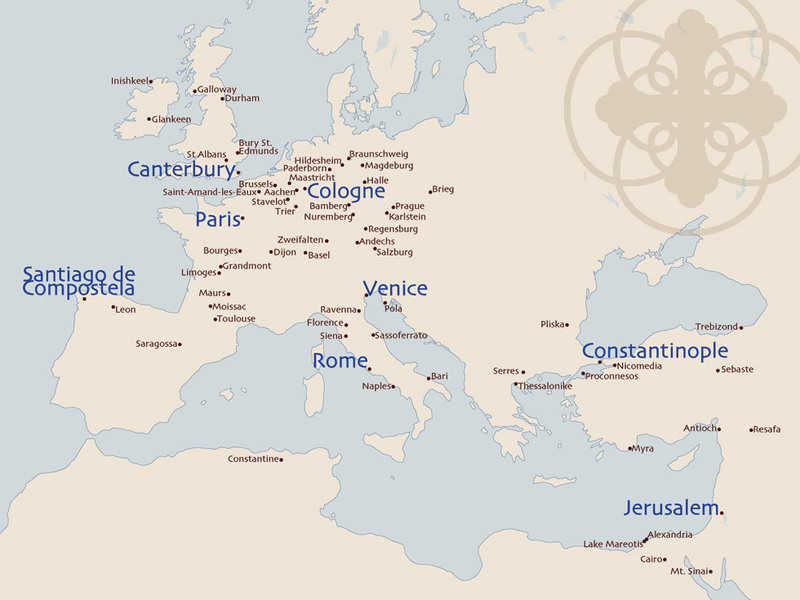 Yet, to be a pilgrim in late Antiquity or the Middle Ages meant much more than traveling to a destination considered to be a holy place. It meant undertaking a journey that was physically and spiritually taxing, since pilgrims committed to crossing great distances, often by foot, while paying penance for their sins along the way. Despite the many hardships that pilgrims faced enroute, including robbery, hunger and illness, they also stood to gain a great deal. As noted by the fourth century theologian, Augustine, Bishop of Hippo, holy places, like a saint's tomb, were frequently the site of miracles. In fact, Augustine encouraged the recording of such miracles so that future pilgrims knew what to expect upon their arrival. In addition to hoping for a miracle, a pilgrim might receive an indulgence for visiting a specific saint's tomb, or a place considered to be important to the life of Christ. An indulgence is a special dispensation given by the pope which partially—or in some cases entirely—absolves the penitent of his or her sins. Typically given in exchange for conducting a pilgrimage to a saint's shrine, indulgences were also sometimes granted for saying a certain number of prayers before images thought to have miracle-working properties. This led to the practice of conducting a pilgrimage in one's heart, instead of with one's body.